The remote maintains two watchdog timers. If the remote fails to hear any messages from the control site for more than about 10 seconds, it aborts any transmissions in progress. WriteLog Control site is programmed to send an idle message more often than that. The remote site accepts only one login “at a time.” But if a login request comes in and nothing has been received from the currently connected control site for 30 seconds, the old connection is terminated and the new one accepted. If you’re logged in on the remote via a remote desktop (or present at the shack while someone else is controlling it) the on-screen changes are cosmetic. You can click on WriteLog menus and change the appearance and even bring back the Entry Windows while the remote is connected. But none of this is recommended as the control operator can’t tell you’re making changes. When run from its WriteLog Control Site icon, the automation classid is under “WriteLog.ControlSite” instead of “WriteLog.Document”. To get a definition in your automation tool for WriteLog.ControlSite, use the newer version of WriteLogClrTypes.dll distributed with WriteLog. 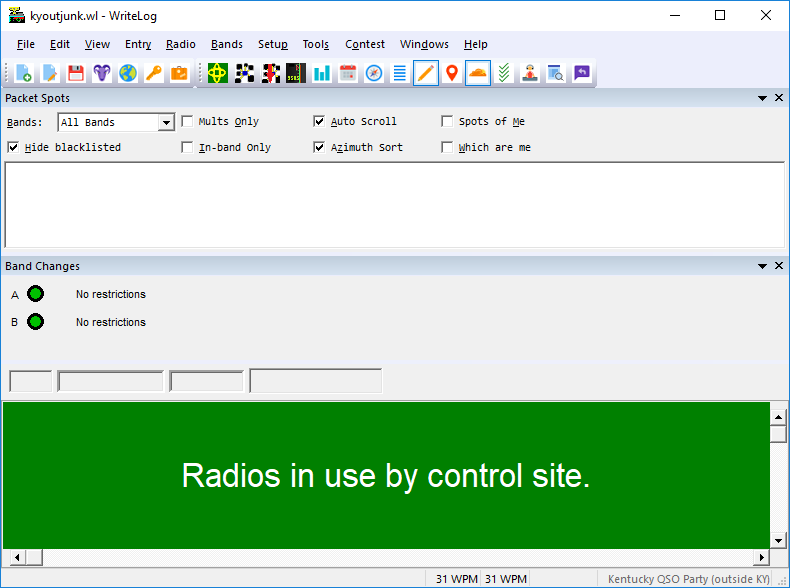 The remote site (and not the control site) outputs band encoding information via OTRSP or other DVK as configured, but only if an Entry Window at the remote site is connected to the rig. This is true whether or not remote control is in progress.